Summer Screens has been leading the way in open air cinema since 2011, bringing our events to some of the country’s most beautiful and unusual locations. From the lawns of stately homes and ornate gardens, to the ruins of medieval abbeys and cathedrals, Summer Screens takes open air cinema to some pretty spectacular places. 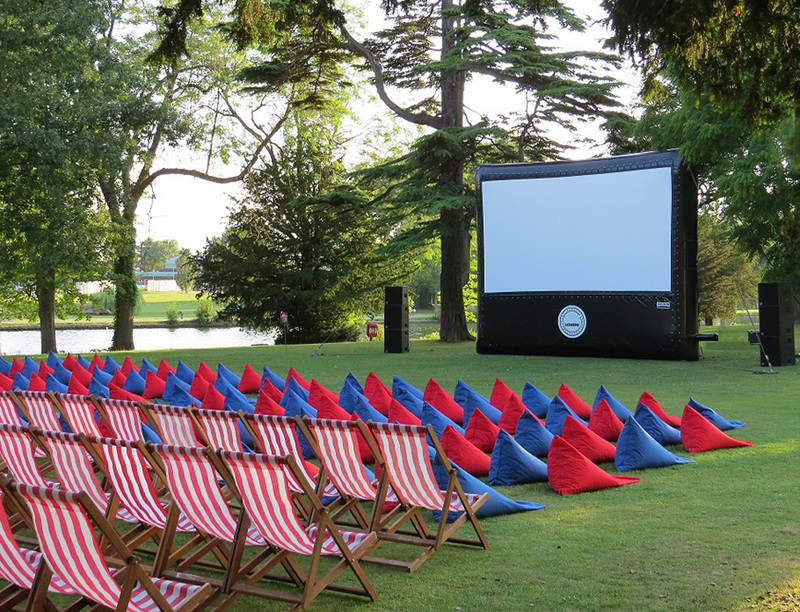 Guests can bring a picnic and a blanket, or choose to enhance their experience with one of our bean bag or deckchair packages, offering a prime viewing position and everything required for an evening of open air cinema, including a complimentary drink, popcorn and chocolate. All Summer Screens events have a fully licensed bar, selling a range of alcoholic and soft drinks including great wines, prosecco, craft beer, cider and of course, popcorn! There are also fantastic hot food options available at certain venues too. A fabulous night of open air cinema wouldn’t be anything without a great film, and these are shown in full high definition on our giant screens with a state of the art audio system, to complete a truly magical cinematic experience under the stars. The doors open at all of our events a minimum of 90 minutes before the start of the film. Film times vary throughout the summer depending on sunset and can differ on the night by up to 30 minutes depending on the conditions. It is never before sunset and never before the published time. What are the different ticket types and extras? Once you have selected your film tickets, you are able to add some of our fantastic seating options to your purchase to really enhance your Summer Screens open air cinema experience. All our deckchair and bean bag seats are located in a prime position and the front of the venue and come with a complimentary drink, popcorn and chocolate. For further information please see our Ticket Options page. Can under 18’s come to Summer Screens? Guests aged 5 to 17 are welcome to attend Summer Screens events if they are accompanied by a parent or guardian and the film is of the correct certification. Unfortunately babies or children under 5 years old are not permitted at any of our events. Can I bring my baby to the event? Do any of your screenings have subtitles or audio descriptions? Summer Screens will be showing Bohemian Rhapsody with subtitles at certain venues in 2019. Audio Description will also be available on request via headsets. These screenings are advertised with the recognised ST/AD logos. Do Summer Screens provide personal assistant and carer tickets? Summer Screens follows the CEA guidelines for personal assistant and carer tickets at cinemas. Guests aged 18 years and over are eligible to apply for a free ticket if they receive one of the following. To arrange a ticket, please contact See Tickets who will be able to assist you. Do all venues have toilets? Yes, all our venues have toilets. No dogs are allowed at any of our events. All our venues are non-smoking. The use of electronic cigarettes is allowed however please move away from the where people are sat to use your device. Summer Screens open air cinema is as the name suggests, an outdoor event and will always go ahead in the event of rain, so if the forecast is less than favourable on the day please come prepared for the conditions. Screenings are only cancelled if the weather creates a safety concern at the time of the event. Umbrellas are not permitted in the main seating area during the film screening out of consideration for other guests as they block the view. Guests are welcome to move to the back of the auditorium if they wish to use an umbrella. Blankets are not provided with any of our tickets. Please come prepared or alternatively, blankets are available to purchase at the bar. The Summer Screens bar is available at all of our events serving a range of alcoholic and non- alcoholic drinks including wine, prosecco and craft beers and popcorn. Hot food is available at some of our events, please check the specific venue page for more information. Yes, you are welcome to bring your own food and drink at all of our events unless otherwise stated. Please be aware that if you do bring your own items, we do not have the facility to dispose of your waste and kindly ask that guests take this home to be recycled. Please also be aware that drinking glasses are not permitted at any of our events, plastic only please. The standard option is an e-ticket to print at home however, you can request to be sent a paper ticket if you choose. The costs associated with this option are clearly laid out at the point of purchase. Yes, you can bring your own chair or seat if you want or choose to add one of our fantastic bean bag or deckchair packages. Is Summer Screens the new name of Cult Screens? Find a venue, choose your film, and then enhance your experience with one of our bean bag or deckchair packages.